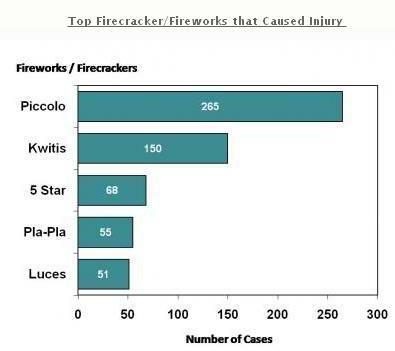 Figures from the Department of Health show that most injuries during last year’s holiday celebrations were due to five popular firecrackers: piccolo, kwitis, five star, pla-pla, and luces. Over one-third of the 1,022 victims were children aged 1 to 10. There were also 39 victims of stray bullet last year while 11 suffered from firework-ingestion. Most victims were residents of Metro Manila (581), Ilocos Region (73), Central Luzon and CALABARZON (66 cases each), and Western Visayas (65). Injuries sustained during the holiday celebrations resulted in blasting without amputation (79%), eye injury (15%), and blast injury with amputation (6%). Last month, the health department launched a nationwide firework-injury reduction initiative dubbed “Aksyon: Paputok Injury Reduction” or APIR. “Apir” means giving a high-five in Filipino. President Benigno Aquino III echoed DOH’s campaign during his annual New Year message, urging the public to stop patronizing firecrackers. , saying these. He added that firecrackers not only endanger the life and safety of many Filipinos – it also worsens air pollution in the country. Ona reminded parents that children should not use any fireworks, and that people must stay away from exploding fireworks. He added that used fireworks should not be picked up. Once injured, the victim should immediately seek treatment from the nearest hospital. 4) Use the time to reflect on the lessons of the past year and make resolutions for a better 2012). Natagpuang patay sa loob ng isang sasakyan ang aktor na si Tyron Perez nitong Huwebes, ayon sa ulat ng Philippine Entertainment Portal (PEP). Sa artikulo ni Karen A. Pagsolingan, na lumabas sa PEP nitong Huwebes ng gabi, sinabing unang kumakalat ang balita tungkol sa pagpanaw ng aktor sa Internet. Wala pang gaanong detalye pero ang anggulong “suicide” umano ang dahilan. Kasalukuyan nang nangangalap ng iba pang impormasyon ang PEP.ph tungkol sa nangyaring insidente, ayon sa ulat. Mabilis na kumalat sa Twitter ang nangyari sa aktor at nanguna ito sa trending topic. Si Tyron, 26-anyos, tubong Tarlac, ay produkto ng reality based talent search ng GMA 7 naStarStruck noong 2003. Pagkaraan ng ilang taon ay lumipat siya ibang television network. This raises the possibility that Perez has been dead for several hours now. More importantly, the officer stressed that the cause of death remains unknown since the police are still conducting an investigation. American Idol Season 1 winner Kelly Clarkson has endorsed Texas Rep. Ron Paul for the United States presidency. In her 41-word Twitter post dated December 29, Clarkson, a native of the Lone Star State, wrote that she “liked” Paul a lot during the 2008 Republican primaries even if “no one” gave the Libertarian-leaning candidate a chance. “Man, my eyes have been opened to so much hate tonight. If y’all ever disagree with something I say please don’t feel the need to attack me. I will listen to what you say and any articles or viewpoints you have when you say it with respect. The Texas GOP primary is scheduled on April 24, 2012. Clarkson’s endorsement comes on the same day Kent Sorenson, Minnesota Rep. Michele Bachmann’s campaign manager in Iowa, announced that he is defecting to the Ron Paul camp merely six days before the Hawkeye State holds its caucuses on January 3.
Who wants to work on December 31 and January 1? No one does. But sometimes, the nature of your work makes you forgo the holiday. During my hospital confinement last week, I asked the nurses if they’re required to work during Christmas, and they answered yes. Same goes for call center agents, policemen and women, tollgate collectors, mall sales clerks, and many others. Given these realities, it is important to know the pay rules for the said day. *No pay, unless there is a favorable company policy, practice or collective bargaining agreement (CBA) granting payment of wages on special days even if unworked. December 31 and January 1 falls on a weekend, a rest day for most employees, you may be entitled to a corresponding overtime pay for reporting to work on that day (better clarify this with your employers). Don’t be absent on December 29, the last working days before these holidays, because doing so will automatically disqualify you from getting any holiday premium. PS: What about January 2, 2011? As things are, it is a regular working day. Stop the wishful thinking. First of all, a Merry Christmas to my dear readers! This year’s Yuletide season is particularly more momentous for me since I just underwent a gallbladder removal surgery last December 20 at a private hospital here in Metro Manila. My internal medicine doctor recommended me for an operation because of the presence of stones in my gallbladder (gallstones or “bato sa apdo” in Filipino). The whole ordeal will be tackled at length in future posts, but for now, I’ll focus on how you can apply for PhilHealth benefits because it can really help a lot. The cost of my hospitalization almost reached P100, 000 (hospital bill plus the professional fees), and luckily, PhilHealth shouldered roughly a third of it. Please take note of the fact that I’ve only made 28 contributions to them so far. First question: Does your employer deduct PhilHealth (or Philippine Health Insurance Corporation) contributions from your regular salary? You can check that in your latest pay slip. Monthly premiums are shared equally between the employee and the employer. These, according to the PHIC website, are remitted by the employer through accredited payment centers nationwide. Keep in mind however that some companies do not entitle contractual employees (or casual, non-permanent) to PhilHealth benefits. After securing this, you also have to submit your updated Member Data Record sheet. In case this is not provided by your employer, proceed directly to the nearest PhilHealth office. For those living in Metro Manila, this directory may be helpful. Let’s now proceed to Claim Form 1, which is the most important since it has to be signed by your employer. My company has ready-to-claim CF1s (signed in advance by our HR head). You must submit the sheet originally signed by your employer. You can download PhilHealth Claim Form 1 here. Claim Form 2 is usually not provided by employers (alongside Claim Form 3), since hospital staffs are the one working on this. In any case, you can download PhilHealth_ClaimForm2 here and PhilHealth_ClaimForm3 here. Why is it more convenient to file PhilHealth claims before your hospitalization? This is helpful if you do not have large cash on hand (some hospitals won’t allow you to be discharged unless you settle all incurred bills). If you opt to instead seek reimbursement for the expenses after the operation, the processing of claims takes 60 working days. Also, some HMOs require their members to immediately file for PhilHealth benefits. PS: What I’ve written here applies only for locally employed PhILHEALTH members. Jay Sonza to Kris Aquino: A mere apology would have sufficed. So far, this Facebook note written by Jay Sonza, a veteran broadcast journalist and 2010 vice presidential candidate, has been shared over 6,000 times. Titled “Iparating Ito Kay Kris Aquino” (Let Kris Aquino Know of This), it sums up what an irate public thinks about the news of the President spending an hour or two last Sunday night in the Presidential Security Group’s Christmas party, a fact revealed by the tweets of Valerie Concepcion. 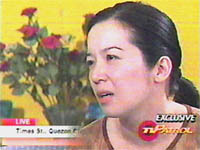 This is what Kris Aquino told the nation Monday morning on her television program. Jay Sonza to Kris Aquino: "When your mother died, every single Filipino stopped whatever he or she was doing at that time, and paid homage to her! " When your mother died, every single Filipino stopped whatever he or she was doing at that time, and paid homage to her! Pang Pnoy, masama bang makipaglamay ka sa amin? Now, your brother is President and he cannot even spend a few minutes attending to relief and avacuation operations in Cagayan de Oro City, Iligan City, Negros Oriental, Compostela Valley and other affected areas? We mourn for your father, Kris. We vowed to sacrifice our lives for your father get justice. Many of our colleagues were jailed, others are still missing to date. Our lives stopped when your father and mother died. Don’t you ever tell us, us, the Filipino people that we will not mourn our fellow Filipinos, especially the Mindanaoans who died during this typhoon. We are not like you, who do not care. We care for fellow Filipinos, poor ones, who became victims. More than a thousand lost their lives because of the ingratitude and the ineptitude of their leaders! Thousands more lost their futures because of the callousness of the leaders like your brother, Kris. A mere apology would have sufficed. Read Mr. Sonza’s original post here. Reacting to noted constitutionalist Fr. 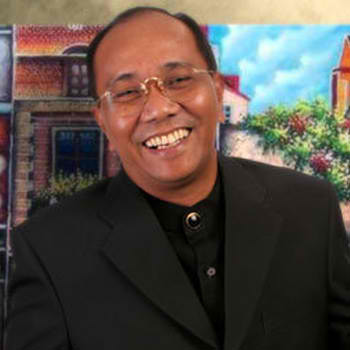 Joaquin Bernas’ criticism that President Benigno Aquino III acted like Cuban strongman Fidel Castro when he ordered the initiated the hasty impeachment of Chief Justice Renato Corona, Palace spokesperson Edwin Lacierda pointed out that United States President Barack Obama also engaged in Supreme Court-bashing in front of a joint session of Congress last year. He is right. In his 2010 State of the Union address, with six of the nine US high court magistrates, including Chief Justice John Roberts, in attendance, Obama slammed the Supreme Court for ruling that private corporations are allowed to donate money for or against certain candidates and causes as long as there’s full disclosure of where the contribution is going. The court’s ruling overturned a century-old restriction. In a 5-4 decision led by the court’s conservative bloc, the justices said that corporations had the same right to free speech as individuals, and for that reason the government could not stop corporations from spending to help their favored candidates. Many analysts predict the ruling will benefit Republicans in next fall’s midterm elections. It will be prudent to point out the differences between the dynamics of the two Supreme Courts. The mandatory retirement age of Filipino magistrates is set at 70, while American high court justices can serve indefinitely. Because of this, it is highly unlikely that a single American president can appoint a majority of them (unlike here in the Philippines). For instance, George W. Bush was able to appoint only two SC justices during his eight-year term. “It is not at all unusual for the Executive Branch to disagree with the Judicial Branch. But what is considerably unusual is for the Chief Executive to look down on the members of the Judiciary in public … and to their faces denounce the Court’s independent actions, as the Chief Justice sat speechless, motionless and expressionless because of the requirements of protocol,” he added. Notice any similarity in the way the statements were worded? Seems like Aquino has long prepared for a battle against Corona.